Thanks to services like Dropbox, many of us take it for granted that we can keep our files in sync across many machines, and that backup copies of those files will be saved up there in the cloud. But what if you want to use online file-storage with a group--to share files among your co-workers, say? Most of these same services provide straightforward file sharing in addition to storage and synchronization. Some go beyond those basics to offer the kinds of tools--such as file permission controls--that you might find on a file server. Sharing files among multiple users can be complicated. A group might be temporary, existing only for the duration of a project, or long-term. Its members might all be in the same office or spread across the globe. Whatever the configuration of the group, online file-storage/syncing/sharing services must be able to make sure that everyone has the same version of the file, and that the changes one person makes don’t overwrite those made by someone else. To find out which online storage services might be best for group use, we chose to focus on a few services that we felt represented the wider field. Our criteria: We looked for services that synchronize files on multiple users’ machines to the cloud. They had to have Mac- and Windows-compatible client software that automatically uploads and downloads changed files (or pieces of files) to all associated computers. They had to provide some kind of controls over which folders and/files were shared with which users. They needed to keep backups of older versions of documents and be able to restore deleted files. We found dozens of services that qualified under most, if not all, of those criteria. We chose to focus on five that represent the gamut of what’s available, that met the criteria most closely, and that have been in operation long enough to have a reliable track record: Box.net; Dropbox itself; the Mac version of Microsoft’s Live Mesh 2011; Sugarsync; Syncplicity. For the sake of comparison, we looked at Google Docs as well, even though it isn’t directly comparable to the others. In our tests, all five performed as they should: They synchronized, updated, tracked, and retrieved files just as one would hope. Even more remarkably, I was able to run all five services at the same time, without any noticeable glitches. (Don’t try this at the office, though: If you aren’t careful about which folders you’re syncing with which services, you can wind up in a recursive house of mirrors.) The differences came down to things like version archiving and the special features they offer in their business accounts. Pricing varies, but not enough to make that a paramount concern when you’re evaluating. The idea here isn’t so much to recommend a specific service (though we’ll do that) as much as to give you an idea of what to look for when you’re investigating them yourself. All but one of the services we looked at offer desktop clients for both Mac OS X and Windows; Box.net is currently beta testing its Mac client. In some cases, those client apps give you access to almost every feature the service offers; others let you do little more than control local preferences (such as bandwidth throttling for file transfers). 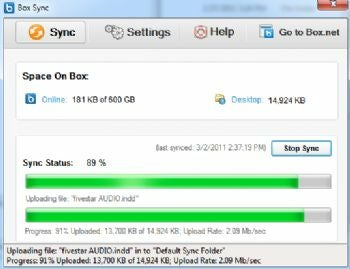 SugarSync’s software provides the most functionality, despite its scattered approach; Dropbox provides comparatively little. One thing to remember about a service’s reliance on a desktop client: Unless your collaborators (co-workers, clients, contractors, and so on) already use the service, you’ll have to convince them to download and install the necessary software. If they don’t, and they use the service’s Web interface alone, they may be second-class collaborators. The services vary widely in the quality and availability of mobile clients for the iPhone and such. Syncplicity and Live Mesh 2011, for example, offer no native smartphone clients; you have to use their mobile Web apps instead. Box.net, Dropbox, and SugarSync, by contrast, provide software for the most widely used smartphone platforms in the U.S.
All of the services except for Microsoft’s Live Mesh allow you to manage files via Web apps as well as from desktop or mobile clients; some of them require you to use the Web for some operations (such as restoring old versions of files). Dropbox’s Website is very Web 1.0; for example, most actions require a new page to load. Other services offer true Web apps or rely on Flash for quicker, more desktop-like access. These services vary in what they allow you to share, and how they let you share it. All except Dropbox allow you to share any folder you choose; some also allow you to share individual files. Dropbox opts for simplicity, allowing you to share just a single folder named Dropbox (including that folder’s nested contents); there are workarounds to that, including manually creating symbolic links or using a third-party utility such as MacDropAny. Of the five services we looked at, only Syncplicity limits the number of computers that can sync to a given set of files or folders: if you have a free or personal account, you can sync two computers at a time. Box.net restricts desktop syncing to its paid business accounts. Windows Live Mesh 2011 is unique in that it will let you specify which computers a folder will sync with. Dropbox and Windows Live Mesh 2011 are the only services that synchronize directly between two machines on the same local network, without a round-trip out to the Internet. That’s a distinct advantage when you’re sharing large files with people in the same office. When multiple users share files, they may make changes simultaneously, creating conflicts. All of these services except for Windows Live Mesh 2011 will notice if a file is synced at the same time from two different parties and then create conflict copies (typically labeled by user or machine name). But none of them achieve the level of version-control that’s offered by Google Docs, which tracks all changes behind the scenes and applies them live to all users at the same time. Even when glitches occur, putting files out of sync, Google warns you and asks you to close and re-open the file. These services vary widely in the granularity of their file permissions. For example, Dropbox lets you set permissions on an entire folder, not for individual files. Furthermore, Dropbox’s permissions give all users editing rights; other services let you grant view-only access to specific items or folders; some offer even finer control than that. Box.net allows you to assign seven different kinds of permission to a folder. Many of these services let you share a file or folder with anyone for whom you provide an e-mail address, even if he or she doesn’t have an account with the service; in some cases, that outsider can also share the file or folder with others. Some of them also allow you send out public links (which enable anyone to download a file from the service’s Website) or links that only the recipient may use or that works one time only. Except for Windows Live Mesh, all of these services save older versions of files. However, they vary in how many versions they store and in how they count those older files against your storage quota. Most will track who has made changes to a file. Being able to retrieve older versions is particularly important when you’re sharing files with a group; while you may have local backups of the files you’ve used, cloud-based tools save changes more frequently, making retrieval of previous versions easier. In an age of server break-ins, encryption protocol exploits, and man-in-the-middle attacks, any online storage service aimed at business users should secure data in transit as well as in storage. Microsoft provides less information about its security measures than some other services. What happens if the company loses your data? It’s a valid concern: Not too long ago, Google temporarily deleted hundreds of thousands of Gmail accounts, and it was days before it restored all of them. Some services, including Syncplicity and Dropbox, provide more detail about the care they take of your files than others.